The Santana adds a bit of German prestige and world-class quality to DRAC’s fleet which has strategic offices nationwide for the general motoring public. It also services 300 of the top corporations, offering not just daily, weekly, and monthly rental services of sedans, SUVs and light commercial trucks, but also long-term full operating lease and lease-to-own rentals, and even a dedicated auto servicing shop for the repair and maintenance of its vehicles. Aside from the Santana’s affordable purchase price of P 686,000 DRAC stands to enjoy a worry-free maintenance experience with its comprehensive warranty package. 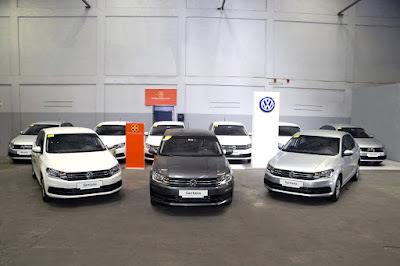 Aside from the three years or 100,000-km general warranty (whichever comes first), Volkswagen Philippines also offers a 3-year warranty for paint and another 3-year warranty for through-corrosion of the main steel body structure. The periodic maintenance service (PMS) interval schedule is also structured for DRAC’s convenience. The PMS interval is once a year, or every 10,000 kilometers, whichever comes first. This is more convenient and more cost-efficient compared to the industry-standard 5,000-km PMS interval, and thus lessens the downtime for each Santana unit, and increases its productive time being in clients’ use. DRAC, with headquarters along West Service Road in Paranaque, maintains branches in Festival Mall in Alabang, Muntinlupa, SM Center in Pasig City, SM Clark in Angeles City, Pampanga, Calamba in Laguna province, SM Iloilo, SM Cebu, and SM Davao.